Counselor Troi is kidnapped by Romulan dissidents, surgically altered to appear Romulan, and forced to play along with a complex mission involving the future of the Romulan government. Good teaser openings are the ones that leave you utterly perplexed about what's going on. This is one of the best. This is the third time Carolyn Seymour, the actress who plays Commander Toreth, has appeared on TNG, and the second time she has been a Romulan in command of a warbird. In "Contagion," she played Subcommander Taris. They say the reason she does not reprise the role here is that it is assumed she perished at the end of that episode, though I personally think that's a weak explanation. (It more likely has to do with royalty checks.) It would have been more interesting if Taris returned in this episode, now a full commander, and that her connection to the earlier episode went largely unstated, but alas, it's a lost opportunity. Despite all this, when I think of Carolyn Seymour, Star Trek is not the first thing I connect her with; she'll always be one of the evil leapers from Quantum Leap or Dr. Chakwas from Mass Effect to me. Romulans like to kidnap people going to conferences, don't they? They did it to La Forge in "The Mind's Eye." Worf looks much slicker in a pony tail. By introducing a character who actually defected from Starfleet--for moral reasons, no less--the show continues to push boundaries that Roddenberry might have taken issue with. On top of that, the kidnapping of Troi actually worked out for the best, which has serious and uneasy moral implications. I'm not saying with any certainty that Roddenberry wouldn't have approved, but the fact that the writers aren't letting it get in the way of telling the stories they want to tell means that the show is continuing to mature, even in Gene's absence. You gotta love the beauty of M'Ret's plan. He exploits the fear and loyalty given to the Tal Shiar to accomplish his defection, which is spurred by his disapproval of the repressive nature of Romulan government. The means of his defection, then, are a way of proving his point. The dynamic between Toreth and Troi is dripping with dramatic irony. 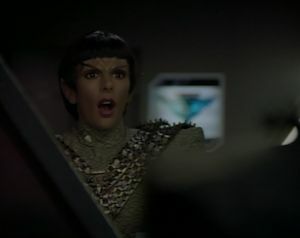 Toreth is the antagonist here, the obstacle standing between Troi and the completion of her mission. Since they are pitted together thus, and because Seymour plays the role of a villain quite well, it's easy to miss the fact that Toreth is actually one of the good guys. Sure, she's a formidable Romulan officer who doesn't hesitate to attack the Enterprise, but she's also got the balls to stand up to the repressive Romulan government, to openly question an agent of the Tal Shiar. Despite it all, Toreth is completely right, her motivation--her father's execution--is relatable, and under different circumstances, we would be rooting for her. It's interesting how openly disdainful Worf is for the defector, given that he too has had to sacrifice his personal honor for a greater good and that, among Klingons, he is still considered a black sheep. This is the second time, after "Redemption II," that the Enterprise has opened up communications with a Romulan vessel and been surprised to discover that it is apparently being commanded by an Enterprise crewmember. This is quite possibly the most important episode for Troi so far (and my personal favorite Troi-centric episode), as it forces her to undergo a pretty significant change of attitude. In Season 5's "Disaster," Troi is thrust into a position of authority--of command--and she is understandably unsure of herself. She learns from the experience, but she doesn't take away the importance of decision-making, of why she needs to have authority in such a situation. In this episode, her character starts as a timid, confused abductee who is willing to do whatever her captor, N'Vek, tells her. She has to put on the face of authority in order to accomplish her mission, and she quickly goes from playing a role to being the dominant force on the ship. By the end, she's barking orders at N'Vek as though she really is an agent of the Tal Shiar, and when it is all over and N'Vek is dead, the weight of her decisions is not lost on her. She has more respect for the ensigns of command, but she also has more confidence in herself and her own ability to lead. It will be interesting watching where her character goes from here.